Maryland blue crabs have become known throughout the US, and even worldwide as one of the most sought after seafood delicacies. 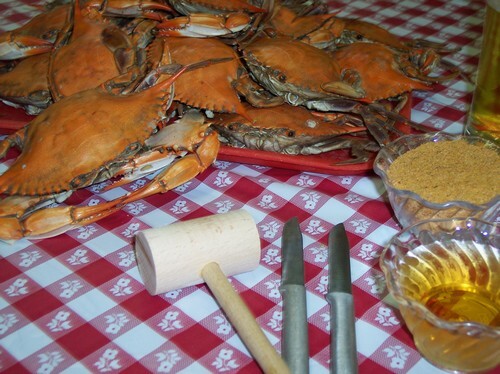 Order online and bring a true Maryland tradition to your table with an all American Crab Feast! Sure to be a delicious and lasting memory for all to enjoy. Maryland Blue Crabs are thought by many to be the best tasting crabs available. Having a light, sweet taste, and hearty texture makes the blue crab a true seafood delight. Even the blue crabs scientific name (Callinectes sapidus) describes it very appropriately. In Greek callinectes means "beautiful swimmer", and sapidus is Latin for "savory" or "tasty". All of our crabs are caught daily by local watermen from the Chesapeake Bay. Once they reach our docks they are steamed, seasoned to perfection (Optional), and prepared to your exact order specifications. All orders are placed in styrofoam coolers with sub-zero frozen gell packs to assure premium freshness. Then shipped that same day via optional Overnight or 2-day shipping. Just like our motto says, "Fresh from the Bay to You!". Re-steaming is the best way to reheat your crabs without any taste lose while keeping the crab meat moist and delicious. First start with a steaming or boiling pot with rack to keep crabs above the boiling water. Add one part water, one part vinegar, and one part beer so your mixture is just below the boiling rack. Bring the liquid to a full boil. Then layer your crabs inside the pot adding JO Seasoning, Old Bay, and salt if desired for more flavor. Cover and re-steam your crabs for 5-8 minutes. Be sure not to overcook and enjoy! You may reheat the crabs by placing them in the oven at 375 degrees F for approximately 5 to 10 minutes. You can also reheat your crabs by placing them in the microwave covered by damp paper towels for one or two minutes. If you are combining crab with a backyard barbeque, you might try placing the crabs directly on the grill. Don't over cook! Once your crabs are prepared gather some newspapers, crab knives, crab mallets, seasoning, vinegar, butter, bowls, beer and refreshments. Cover your table in several layers of newspaper for quick and easy cleanup. Dump your crabs in the middle of the table, then gather your family and friends. Just hurry up and grab some before they're gone! One Dozen Steamed Large Male Blue Crabs all measure 5 1/2" to 6" inches. The shelf life of steamed crabs is 3-5 days under constant refrigeration. Three-and-a-half ounces of crabmeat provides 78 calories, 15.9 g protein, 1.3 g fat, 102 mg cholesterol, 244 mg potassium, and 337 mg sodium. © Copyright 2016 Russell Hall Seafood Inc.. All Rights Reserved. Built with Volusion.